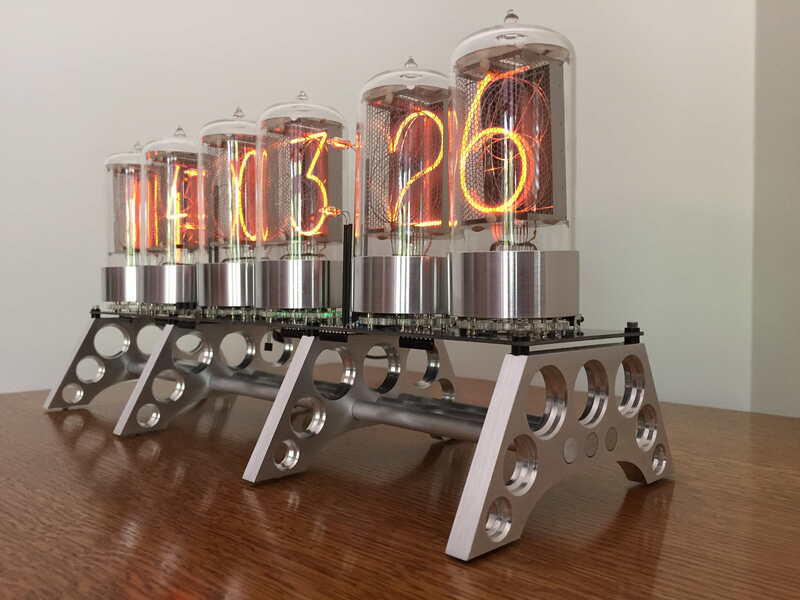 The name Nixie is thought to derive from the Burroughs Corporation’s “NIX I”, which in turn was believed to have stood for “Numeric Indicator eXperimental No.1”. Each glass tube is filled with a neon-based gas at low pressure and features a wire-mesh anode and layered cathodes shaped like numerals – one separate cathode is needed for every numeral 0 to 9. A distinctive orange glow discharge surrounds each cathode when power is applied to it. By connecting electronic circuitry to several tubes, multi-digit Nixie tube displays were often used for computers, clocks and frequency counters, though were eventually supplanted by more practicable, less costly – yet arguably less charming – displays such as light- emitting diodes (LEDs). Many of these tubes were manufactured in Eastern Europe in the 60’s, 70’s and 80’s. They are no longer manufactured anywhere (well almost) – so any tube that you buy will be many years old. That being said, there are lots of people selling tubes that have been in storage for years and are classed as ‘New Old Stock’. Search ebay for offers of tubes for a variety of applications. Tube manufacture has been resurrected on a very small scale by Dalibor Farny, who produces a completely hand made high-end product, a set of 6 will cost in the region of $900.